We supply full automatic concrete block making machines with installation and after sale services. Our machines are imported from Italy and installed by Italian engineers with guarantee of services. We install them all over the world, we train the staff to operate them and we continue offering several services during the whole life of the machines such as technical support, post sale service, improvement of productivity and development of new products. Concrete block making machine from Italy is more durable and reliable. We are the only sales representative for world famous concrete machine from Italy. Make your concrete block and roof tiles making factory with our world class machinery from Italy. Fully Automatic Concrete Block Making Machine in Bangladesh & India. We are the local sales representative for India and Bangladesh of TBLOC srl. Italy, the world famous concrete products making machinery manufacturer in Italy. Concrete block is environment friendly and heat and sound proof as building blocks. 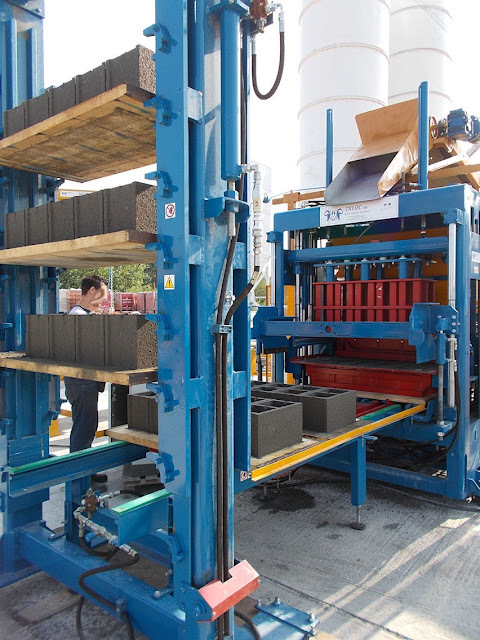 Concrete blocks are more cost effective and reliable. The government of India as well as that of Bangladesh is going to ban the use of red clay bricks for the protection of environment. We should come to help our earth to protect environment for our future generation. We have automatic, semi-automatic roof tiles making machine made in Italy. Roof tiles are used widely for roofing the buildings, sheds and resorts. 1. What is the future of block and tiles making industry? Ans: Block and tiles making industry has a bright future in all countries especially in Bangladesh and India since the concrete block is environment friendly, cost effective, strong, durable and profitable as compared to red clay bricks. The government of India as well as Bangladesh is going to ban the use of red clay bricks to protect the environment. So, no other way beyond making and using of concrete blocks in this territory. 2. Is it profitable to make a concrete block making industry? Ans: Certainly. The production of blocks is cost effective. The cost per block is not less than the cost of production of bricks but if you compare the cost of the project, the cost of block making plant is very much less than the cost of red clay bricks manufacturing plant. So, if you can get profit 10 tk. investing 1000 tk. and 12 tk. investing 5000 tk. which is better? So, block making industry can give you profit investing less money, less hassle, less man power. 3. Why I will buy machinery from Italy? Ans: The block making process involves water, cement, sand and stones or dusts as raw materials. So, your machine should be of good quality to run for a long time. Yes, you can get cheap machinery from China or other countries, but their performance will not be satisfactory. They can make you sufferer in the long run and may cause extra hassle of repairing regularly spending money and time. So, it is your wise decision to buy world class machinery from Italy spending a little bit more money. 4. Will you provide installation and after sale services? Ans: Off course, we will. Our engineers will supervise the installation of your machinery at your project site and will provide after sale services too. Please Contact us for detail information and catalog for Automatic Concrete Block Making Machine prices.